Discussion in 'Forum and Server Announcements' started by BiGUNMAN, Jun 4, 2018. /pvp (not /warp pvp) has been removed. Respawning in the pvp arena has been fixed. Our anti-afk machine system has been changed and fixed. People should be kicked now. Spawn has been moved down (so those with clouds enabled don't have problems with spawn). Wild teleport portal at spawn was slightly changed and fixed (you shouldn't be teleported multiple times). All the NPCs and Holograms at spawn were updated (with some slight changes as well). Voting system was slightly altered. Social links (/website, /social, /discord, /vote) have been updated and slightly altered. Coins will now be rewarded for each hour you play. You will no longer need to play 1 hour straight to receive 1 coin. Launchpads at spawn should work completely. Backpacks have been updated and fixed (they support all types items). /sit - You can sit now (on chairs/stairs). Discord server received a few minor changes. There are currently a few features of the server that still need to be worked on and I'll be publishing an update once at least 5 problems are fully tackled. I will be publishing changes/updates in Discord within 24 hours of their completion. Our current goal with the server is to fix up all the issues we encountered. Make sure all our main features work great, and then begin growing the playerbase again. Great to see the server being fixed. Good luck to the staff team, and best of luck for the future. I'm really excited too see all the changes made. Thank you for talking about this and making speedy fixes. I'm excited for a revival!!! You don't question the mod app, you leave it alone. #ReviveAspiria! And make it like it used to be back in 1.8 / 3 Years ago. Aye! 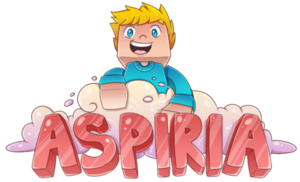 Doing good, join Aspiria's discord! (/discord on the server).